Good Choice Reading: GIVEAWAY: WIN A Signed Copy of Cold Kiss by Amy Garvey! 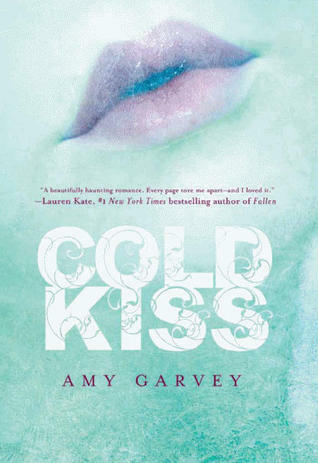 GIVEAWAY: WIN A Signed Copy of Cold Kiss by Amy Garvey! WIN A SIGNED COPY OF COLD KISS BY AMY GARVEY! Courtesy of Harperteen, Good Choice Reading is giving away a SIGNED copy of Cold Kiss by Amy Garvey to one lucky person. This giveaway Ends Wednesday, October 5th @ 11:59 PM. The authors of the Dark Days Tour will be doing a LIVESTREAM event on Thursday, October 6th at 4 - 5:35 PM EST. Submit a question for Amy Garvey, or any of the authors on the Dark Days Tour. They will try to answer your questions on Thursday, Oct. 6th. Leave your questions in a COMMENT below. FILL OUT THE FORM AT THE BOTTOM of this post with Name, Email and Mailing address. NOTE: Any additional comments that do not have a question for the authors, will be removed. Please, if you have any questions at all for us, or just wanted to share a comment about anything in general, send us an e-mail @ Contact at goodchoicereading dot com. We are asking that you help spread the word about this event and giveaway. Tweet it, Facebook it, anything helps! There are no extra entries, but we would truly appreciate it if word got out. Thank you so much in advance! My question is for Amy Garvey: What was her inspiration for Cold Kiss? How did she come up with the idea for the book? My question is for Amy Garvey: Were any of the characters in Cold Kiss based off of people you have known in your real life? My question for Amy Garvey: What was the creative/writing process like? Did you know right off the bat how you wanted your story to evolve, or did it kinda evolve on it's own as you wrote it? For Amy Garvey: Do you have any other books you're working on now that Cold Kiss is finished? My question is for Jocelyn Davies: How many books are going to be in this series? I might just die after that cliffhanger! My question is for all the authors. How much fun did you have writing/stepping into the world you created for your novel? For Kiersten White: I love your blog posts and find your comments hilarious. Did you start blogging and tweeting before you got published? How do you find time to blog and tweet as much as you do while still cranking out such amazing stories? My question is to Kiersten White. Did you base Evie and Lend off anyone you know? Also how did you come up with the fairies names? I love Reth's whole name. Question for Amy Garvey: What made you choose to not only go with zombies, but a romantic take on zombies? My question is for all the authors... what inspired you to write YA books and are there any other genre's you would like to try to write??? Question (for any or all of the authors): Did you have a hard or easy time finding the your characters voice? For all the authors: Did you know from the start how the story would progress? Are you an outliner? Or did you let the characters speak to you as you went along? My question is for Amy Garvey: I loved Cold Kiss. It's one of my favorite books ever. Are you planning to write any more books about Wren? If so, will you explore the mystery surrounding her father? For all the authors: Do you play any music while you write or have the TV on? For Anna Carey: You took a big risk writing Eve the way you did, what is your favorite aspect about her?